If you’re not into this kind of thing, you’ll have almost certainly have turned away in revulsion or put a little sick looking Emoji beneath it on Instagram, or just written it off as “trash.” Shoe conservatives are the worst. We’re not saying that the New Balance M890 is a good looking shoe, but we love the insanity of the colourways that NB have applied to it. Endorsed by the kind of people that a lot of real runners respect like Reid Coolsaet, Andy Baddeley and Eric Gillis, it’s a real running shoe that bears that strange mix of tech fascination and an almost hippyish approach to the sport that proper running shoes often carry. This neutral running shoe is full of things with fancy names, like REVlite and ABZORB cushioning on the midsole and the no-sew upper is the perfect playground to act all ignorant with the colours. 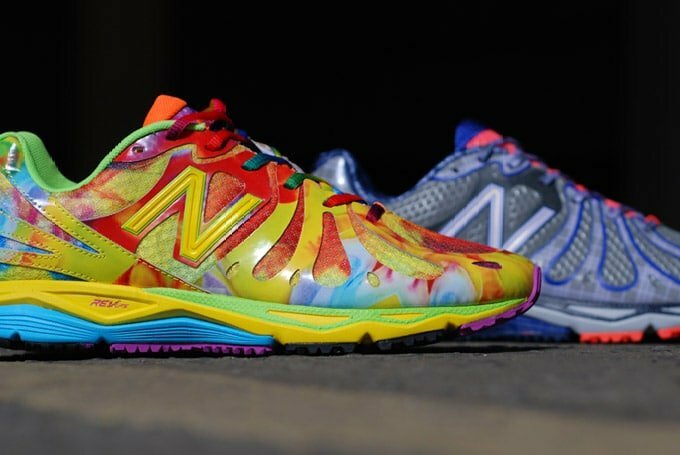 And those designers have gone ham with the shades on the M890TG3 — it’s beautiful in its insanity, with it’s Haight Street :“You weren’t there man!” (which is also the refrain of the aging, embittered trainer guy too) acid dropout tie dye effect. It makes the rainbow RB3 version from earlier this year look super tame, but seriously, isn’t this whole shoe thing supposed to be about turning heads and splitting opinions? Bizarre to see the same guys who wept openly over an inability to get the Galaxy Foamposites last year (or have the brains to do their research and ask nicely)showing deeming a shoe like this as disgusting, buuuuut that’s a whole ‘nother conversation. With the London Marathon coming this weekend, the M890LON3 celebrates that event with a grid pattern on the outer and inner of the shoe — it’s even on the midsole. Part of the same series that included the Boston Marathon edition (salutes to Packer Shoes for donating that NB dough after Monday’s atrocity), there’s a lot going on with that upper, but it works. The fact there’s matching laces in the MTG3 makeup is reason enough to grab a pair. A well executed city themed release and a clown shoe that’s actually killer (word to Pennywise). And best of all, when you get caught up in the current running mania (and trust us, it will get you eventually), you can break these out the box and put them through their paces. Both these New Balance M890s are in the Crooked Tongues store right now priced at £80.